We care for you because you care for our Patients. Come and meet us and see what we can offer, don't just take our word for it though, our team will be on hand to answer any questions you may have about what it is like to work on our units. You are cordially invited to join us for our first ever Respiratory open day. Take a tour around the departments and meet our dedicated team, our Consultants and Specialist nurses will also be available to chat to alongside Senior nurses. The tours will be followed by afternoon tea and then the opportunity to stay and complete a values based interview and assessments. You could leave the day with your dream job offer! An exciting opportunity is on the horizon with the development of a Respiratory Specialist Unit at The Royal Shrewsbury Hospital. We are looking to further expand our existing respiratory team with the recruitment of band 5 staff nurses who want to embrace the forthcoming improvements to the respiratory services offered by The Royal Shrewsbury Hospital and The Princess Royal Hospital. We will give you the opportunity to gain essential skills required on an acute medical ward as well as the specialist respiratory skills which include Non Invasive Ventilation, chest drain and tracheostomy management. We are keen to support the career pathway that suits you and will be happy to discuss the potential of rotating to other specialist areas to gain a variety of skills and experience. We will offer you opportunities to develop in a supportive learning environment and a preceptorship programme to enhance your development. We are seeking caring, highly motivated and enthusiastic Band 5 nurses to compliment our current team. 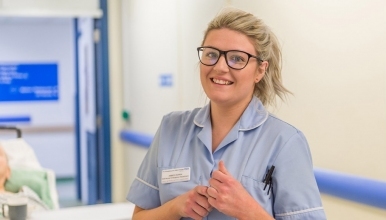 Within the Acute Respiratory unit you will be looking after acutely ill level 2 patients and further develop your skills in caring for a deteriorating patient alongside an experienced multidisciplinary team. You will rotate within the main respiratory ward caring for a variety of patients with acute and chronic respiratory conditions. The ward is extremely rewarding and in return you will be provided with on-going career development, support and supervision. Successful applicants will be joining a team who are committed to the respiratory service, and who are constantly driving the service forward. The Trust is proud to have been selected through a highly competitive national process to partner with The Virginia Mason Hospital in Seattle, widely regarded as one of the safest Hospitals in the world. This partnership will see Doctors, Nurses and Allied Health Professionals working together with colleagues from Virginia Mason and across the country to transform Healthcare at The Shrewsbury and Telford Hospital NHS Trust and share learning across the country. Together with our staff we have developed a set of Values which form a framework for a positive and supportive environment for our patients, visitors and staff. We believe that all candidates should be able to demonstrate and be equally committed in fulfilling these Values to be successful in their application. It’s very important that we select the right nurses to come and work for us. The selection process for all nursing posts will include Conversions, Medicines Management and Nursing Practice Numeracy Test. You will be invited to sit these assessments if you are successful for the position.